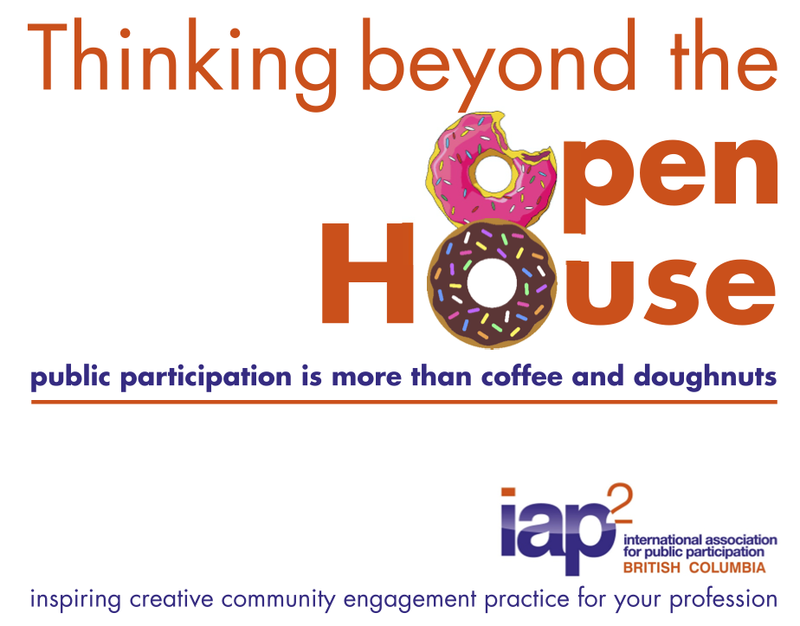 As part of its Thinking Beyond the Open House series, IAP2 BC hosted a panel discussion on public engagement for architects and engineers. The purpose of the events is to inspire creative community engagement practice for the professions. A diverse group of 35 P2 practitioners, engineers, architects and students gathered in a private room at the Devil’s Elbow on October 8th to hear lessons learned from some prominent Vancouver architects, sharing their experiences in public involvement. These included James K.M. Cheng, C.M. (speaking in the photo at left), one of the architects (in both senses of the word) of “Vancouverism” – the planning concept that focuses on high density with open spaces conducive to social interaction; Ray Wolfe (at bar, left), Stantec’s BC Education Sector Lead, whose work has included the Student Union facilities at Thompson Rivers University in Kamloops and transforming former CFB Chilliwack into a new campus for the University of the Fraser Valley; and Paul Wilting (right) Division Manager, Collection System Engineering, with Metro Vancouver, whose projects tend to be large-scale efforts serving a region of 2.5 million people: all three are well aware of the importance of having people affected by a project onside. Don’t miss this opportunity to join your peers in public participation, to enjoy a bite to eat and a glass of wine or cold beer. There is no better time than an AGM to talk about what works and what does not. IAP2 BC’s Fail Fest celebrates the role failure plays in moving organizations to change. 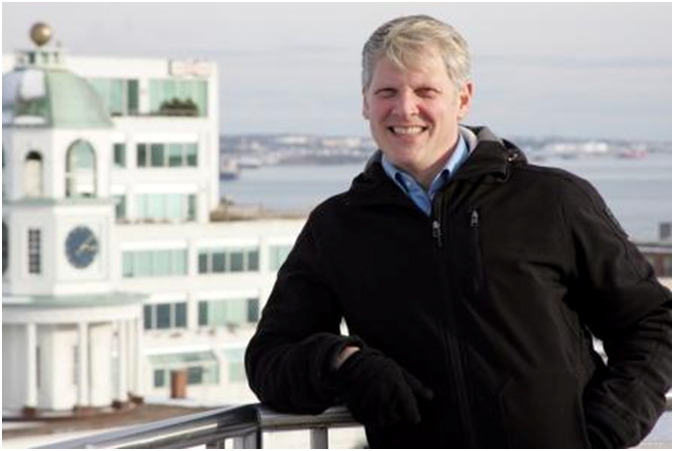 Join IAP2 BC at their AGM and social for a conversation that is sure to inspire, inform and ultimately change the way P2 practitioners perceive failure in our sector. Panel members will provide a short description of their project and the lessons they have learned when things did not go as planned. The panel discussion will be followed by a whole group discussion. I wanted to take this opportunity to reflect on where we are as the newest chapter of IAP2 Canada. We have been slowly getting our chapter organized. In March, both St. John’s and Halifax hosted meet’n’greets for members and friends of IAP2. 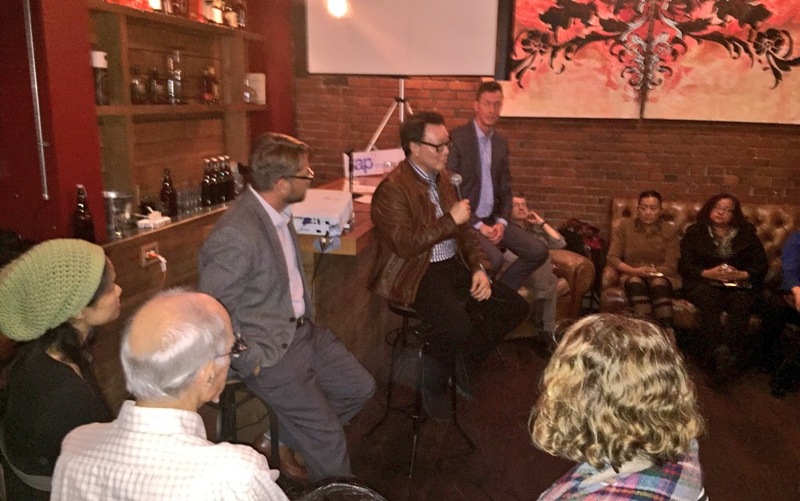 In New Brunswick, Luc Richard and Paul Lang introduced IAP2 to a dozen or so curious New Brunswickers at an event on September 17. As a result, Paul and Luc are working to bring IAP2 Foundations to our francophone colleagues. The Nova Scotians hosted a successful professional development event in Halifax on September 29. EngageNS Chief Engagement Officer Danny Graham spoke to 25 chapter members and guests at a breakfast about the state of engagement in Nova Scotia. Danny talked about the importance of engaging citizens on the big questions facing our society, and he thanked IAP2 for playing a leadership role in championing greater public participation. As an Atlantic Chapter, obviously we have work to do to build our presence and influence in Prince Edward Island. I will be reaching out to chapter members in the near future for ideas on how we engage Islanders. There are times when I feel like things are not happening quickly enough for our chapter but when I reflect on what we have accomplished together since March, I can relax a bit. Rome wasn’t built in a day, after all. We have some work to do together as we look ahead and begin to plan for a fully elected board for our chapter. Thanks everyone for keeping the momentum up. The emerging Yukon Chapter is seeking feedback from interested Yukoner practitioners and members of the public on what folks want the Chapter to be. Chapter Founder John Glynn-Morris has built an initial database of 45 people who took the Foundations course earlier this year, took part in the public event in September, government workers who attended a lunch-and-learn and others and has now circulated an online survey to crowd-source interests. So far, 27 responses has come back. The survey can be viewed here; other Chapters are welcome to use the survey for their own members. Once again, IAP2 Canada is pleased to be a partner with Strategy Institute in the Summit on Public Consultation and Engagement. IAP2 Canada members receive a 20% discount on the registration fee. Check out the information and use the promo code IAP20 when registering. This is an opportunity for you to revolutionize your engagement strategy at the only event in Canada to help you drive engagement and project approval. You’ll find insights from more than 20 top speakers to improve public consultation; you’ll learn from 10 case studies and have more than 8 hours of networking opportunities. Specially designed for Canadian public consultation professionals, this national forum connects you with industry thought leaders and peers for exclusive knowledge sharing. Tap into the collective wisdom to advance public consultation excellence. Adopt new strategies and tools to reduce stakeholder fatigue, garner public support and expedite approvals. Transform your approach to aboriginal consultation by learning directly from the Chief of the Squamish First Nation. Cst. 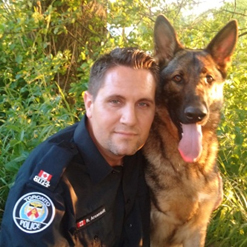 Randall Arsenault, Toronto Police Service. IAP2 Canada’s Brenda Pichette will be among the speakers, discussing P2 Certification and the work of the Certification Task Force; other speakers include Mary Simon, chair of the National Committee on Inuit Education, Tracie Smith of the Thunder Bay Regional Health Sciences Centre, and Cst. Randall Arsenault of the Toronto Police Service. As the field of public participation evolves, taking academic research and “lessons learned” and putting that knowledge into practice becomes increasingly important. On Tuesday, November 17* at 3pm (Eastern)/Noon (Pacific), we’ll hear from two leaders in combining the two disciplines. 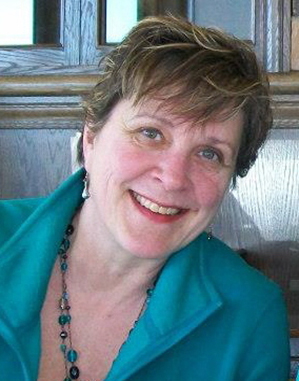 Fiona Cavanagh is Executive Director of the Centre for Public Involvement — a partnership of the City of Edmonton and the University of Alberta. CPI has been producing research work in a number of fields — particularly engagement at the civic level — and also sees those theories put into practice. Joining Fiona will be Stephanie Brooks, Public Outreach specialist with Michael Baker International and a member of the US Transportation Research Board’s Standing Committee on Public Involvement in Transportation (ADA60). The Committee works to enhance the understanding and practice of public involvement as an art and science in transportation policy. *Please note that this is the third Tuesday of the month – not the second, as is our usual practice. Should governments and other public institutions make an effort to “stay in touch” with citizens outside of a specific project that requires public engagement? 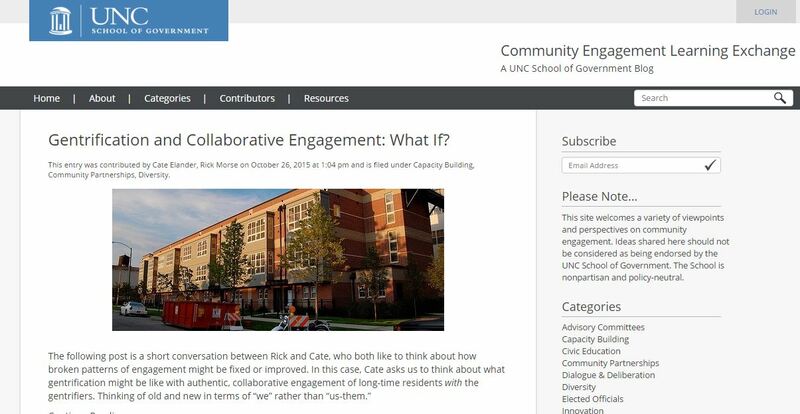 Our October Webinar looked at two initiatives by the School of Government (SOG) at the University of North Carolina – Chapel Hill: a blog called CELE — Community Engagement Learning Exchange – in which people from various sectors write on their views and observations and elicit responses from other “ordinary” members of the public; and “Citizens’ Academies” (sometimes called “County University”, “Neighbourhood College” or “City Hall High”) – a way to educate members of the public on the workings of local government. The initiative is overseen by Drs John Stephens and Rick Morse of the SOG. CELE steers a middle course between the “cheese sandwich” blog – “I had a cheese sandwich for lunch today” – and the extreme-view political blog. The idea, says Stephens, is to draw people into a conversation and exchange views and knowledge. Not that there isn’t controversy. Stephen Hopkins, a community activist in Raleigh-Durham, NC, and former chair of the local NAACP Housing Committee, says he deliberately sets out to provoke people: “I want to get people’s blood boiling enough to want to comment,” he says. Along with Hopkins, contributors to the blog include Kevin Smith, a civic employee in Raleigh who conceived the idea and brought it to the SOG in the first place; and Brian Bowman, communications director for the town of Knightdale, NC. So how are these efforts improving the level and quality of P2? CELE is still in its infancy, and one of the metrics is the number of comments on the blog posts. Morse says there are still not enough of those to declare it a success – or not. He and Stephens acknowledge these things take time, but they are certain they’re on the right track. The Citizens’ Academies are already showing promise, but also have their limitations. Morse says they’re seeing an increase in the proportion of people getting involved in civic affairs and more likely to take part in public engagement efforts when an actual project comes along that needs to be addressed. (Remember that Citizens’ Academies are not driven by a specific project but by general interest in finding out how government works.) One of the limitations is that the Citizens’ Academies tend to be attended by middle-class retired people who have the leisure to take part. Another is that some of the more marginalized people are not able to participate in CELE: Stephens concedes that this is not the best way to reach them. Check out the blog “CELE” here, and learn more about Citizens’ Academies here. IAP2 Canada members can review the October webinar here. I currently work in engagement (public participation) at The City of Calgary. I often work with project teams that are new to the concept of public participation or at the very least are not experienced in that area. Budget and time allowing, it is great to have them take the Foundations of Public Participation training to establish common understanding of what public participation is, why we do it and what is involved. This is a key question that needs to be explored to determine if engagement makes sense for the project at hand. It often comes down to figuring out if there are decisions that can be impacted by input from public and/or stakeholders. Once it has been confirmed that engagement is appropriate, it is critical to develop an engagement plan. This is the road map that outlines the engagement journey that is about to be embarked on. It is really important to share the background information of the project in order for people to feel they know enough to give meaningful input. Take the time to make sure that the people you want to hear from know about the project and the opportunities to provide input. And make sure that is done in enough time that they can make arrangements to participate. This refers to actually having the dialogue in an open and authentic manner. It is important to share what was heard from participants and what was done with the input heard. As well as taking the time to evaluate the process and outcomes for continuous improvement.